This past year has been particularly full of struggles and joys, losses and new adventures. Maybe that’s the reason for my current obsession: doors. The poet in me is all about the metaphor, for myself and for each person in my family. Doors closing (some slamming painfully shut; others slowly creaking closed until you realize you’re in a different place) and others opening (new experiences and things to learn, new art to make, new poems to write, new endeavors to launch, new friends to meet…). 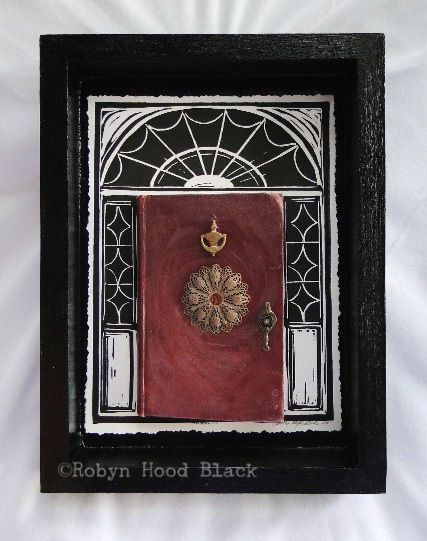 The artist in me is all about a visual description of that metaphor – books as doors! What better than a book to transport us to new worlds, open up new ways of thinking and dreaming and wondering? The door is adorned with a round filigree find from an antique shop, and a vintage jewelry part I bought from a European dealer on Etsy. The door knocker (also purchased on Etsy) is a vintage brass doll house door knocker. I’m stashing all kinds of fun vintage bits of hardware for these. Surrounding the door, with sidelights and a fanlight, is relief print I carved. It’s a simplified version of a doorway in Dublin, the kind I got to see in person when my father-in-law took our whole family to Ireland when our kids were little bitty. 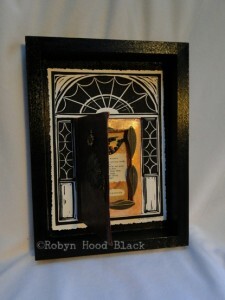 This collage is 9 X 12, in a cradled wood panel painted glossy black. 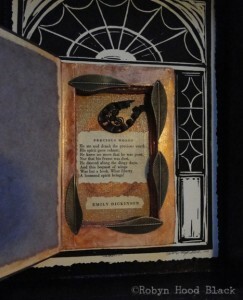 I’m excited about making these collages in different sizes and with different details. When I took this to show my art critique group this month, seeking their feedback, one of the members bought it! That was pretty encouraging feedback. Do you remember any particular doors from your past? I remember the wrought iron gates to the small courtyard in the house I grew up in in Florida. I remember walking through the gi-normous jaws of an alligator to enter Gatorland there, too. And the imposing entrance to the Haunted Mansion at Disney World! How about you? How about now? Perhaps you’re facing big transitions soon – as we’ll be adjusting to our youngest leaving the nest over here. Or perhaps your journey will be less jarring. Whatever doors you walk through this year, I wish you blessings as you come and go, and joy and adventure on the other side. In addition to a wonderful poem, Tabatha sent me some fine hand-crafted teas (from an Etsy vendor!) 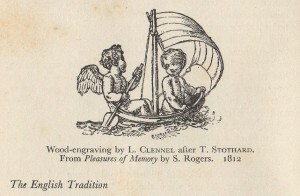 and – be still my heart – a lovely old book. 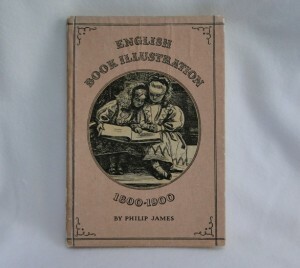 ENGLISH BOOK ILLUSTRATION 1800-1900 by Philip James is a delightful, slim volume chock-full of creative greats of the 19th century. 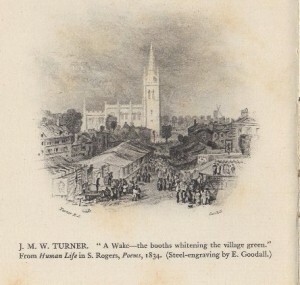 The book was published in 1947 by The KING PENGUIN Books (London and New York.) You’ll likely see it here again, because there’s too much goodness in it to share in one post. Tabatha couldn’t have bestowed this gift on a more appreciative recipient – I’m lapping it up like a kitten at a saucer of milk. On my only trip (thus far!) to New York, while my daughter and friends went to the top of the Rockefeller, I snuck away to the (Pierpont) Morgan Library & Museum (okay, that’s another post, too, because a talented young architect who is the niece of my good friend Peggy was involved in its recent renovation). The point of this side journey here is just to mention that I spent all of my souvenir money on one thing – a delicious hardback book documenting an exhibit they’d hosted previously. 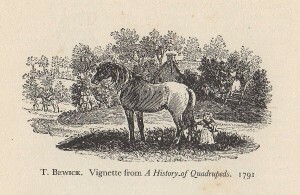 BE MERRY AND WISE, Origins of Children’s Book Publishing in England, 1650-1850 by Brian Alderson and Felix de Marez Oyens is huge, heavy, and brimming with history and exquisite illustrations. I left the $115 price tag on its back. So I am a very grateful nerd to have Tabatha’s gift to add to my shelf, which also includes such nerdy titles as A HISTORY OF THE BOOK IN AMERICA (Amory and Hall, eds. ), THE NORTON ANTHOLOGY OF CHILDREN’S LITERATURE (2005), THROUGH THE EYES OF A CHILD (by Donna Norton, 1983, bought when I was in college or thereabouts and just because I wanted it), and THE ARBUTHNOT ANTHOLOGY OF CHILDREN’S LITERATURE (late 1950s? ), which I’ve had on extended loan from my mother-in-law, and several volumes about reading and writing in 17th Century America. 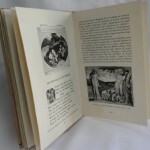 ENGLISH BOOK ILLUSTRATION 1800-1900 features many representative black and white illustrations as well as color plates in the back. These include woodcuts, wood engravings, copper-plate etchings and engravings, aquatints, mezzotints and hand-colored lithographs. 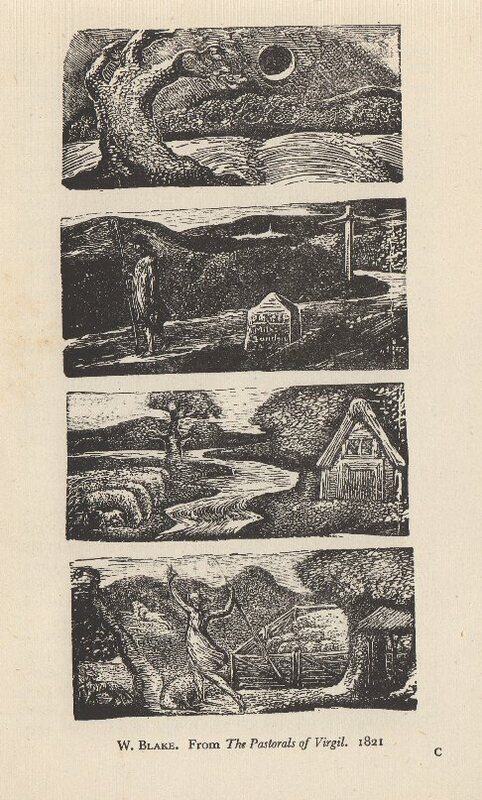 The century opens with Thomas Bewick and William Blake and moves on to the work of Constable, Turner, Cruikshank, Crane, Carroll, Tenniel, Whistler, Beardsley, Caldecott, and Greenaway, just to name a few! I hope so. I’ll never lose my bias, however, for a good old-fashioned, deckled-edge, well-crafted book! Thanks for taking this detour back with me – there will be more, I’m sure. Do you have a favorite artist from the past who inspires you today? I’m so excited! 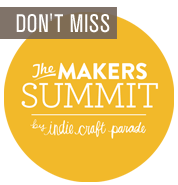 I just signed up to attend “The Maker’s Summit,” an all-day business conference on Feb. 2, 2013 for creatives, sponsored by Indie Craft Parade in Greenville, SC. (The Indie Craft Parade takes place in September.) Speakers include Stephen Fraser (founder, Spoonflower), Grace Kang (founder, Pink Olive and RetailRecipes.com) and Kimm Alfonso (Etsy, community outreach). It’s only a couple hours away from my home in Georgia, so within striking distance, even during a busy weekend on my end. My husband and I met at/graduated from Furman University in Greenville a few moons ago, and our daughter is there now. Back in the day, downtown was not really any kind of destination spot! I loved the art museum, but the rest in my memory was just kind of industrial terrain to stay away from. Now the city is a vibrant tourist destination, with a gorgeous park at the waterfall, many fine restaurants and unique boutiques, horse-drawn carriages, art galleries, and character galore. We love going up there! It this conference is calling you, too, click on the logo above to learn more. Happy Creating! Art Break Wednesday: Registration is Open for SCBWI Southern Breeze Illustrators Day! One of the most ambitious events is always Illustrators’ Day, jam-packed with talks from leaders in the field as well as feedback on artwork. 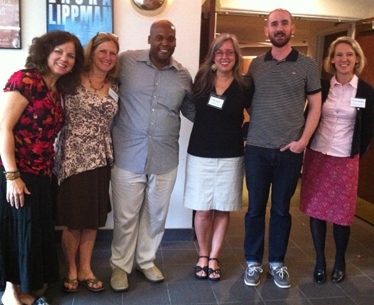 Robyn Hood Black, Jo Kittinger, special guest Greg Christie, Elizabeth Dulemba, special guest Peter Brown, and Kristen Applebee enjoy the SCBWI Southern Breeze 2012 Illustrators’ Day in Atlanta. Held previously in September, the event is moving to the Friday just before the Southern Breeze Springmingle conference in Atlanta, the last weekend in February. Friday, February 22nd, from 10:00am to 4:00pm at the Century Center Marriott (the same location as Springmingle). Cost: $65 per person for SCBWI members, $70 for SCAD or AIA students, and $85 for non-members. Audit options will be available to regristrants after the first 30 slots are filled. Organizers are looking forward to the new date and digs. The incredible line-up of speakers and mentors includes Chad Beckerman, Creative Director for Abrams (Abrams Appleseed, Abrams Books for Young Readers, and Amulet Books) Dianne Hess, Executive Editor at Scholastic and Blue Sky Press,and Will Terry, illustrator and innovator. Illustrator Mark Braught will mentor the first 12 registrees (first-come, first-served) with an assigned project before the workshop. The goal: to create a finished piece ready to show on Illustrators’ Day during the Portfolio Reviews. NEW! Dummy Display: This year a designated table in the portfolio viewing area will be dedicated to the display of picture book dummies. For more information, for links to all these great speakers, and to sign up, click here. For questions, contact Elizabeth O. Dulemba: http://dulemba.com elizabeth at dulemba dot com. Art Break Wednesday – Happy New Year, and Painting with Pencil? I hope 2013 brings you lots of creative inspiration. I’ve enjoyed reading other folks’ resolutions and plans for the coming year. I have lots of projects up my sleeve, but at the risk of expending energy in the wrong place (talking about them) rather than the right place (um, doing the work), I’ll keep most of mine close to the vest. I know myself too well. In the spirit of drawing the line somewhere, though, I decided to take a break today from the “urgent” and spend a few minutes actually sketching in my journal. 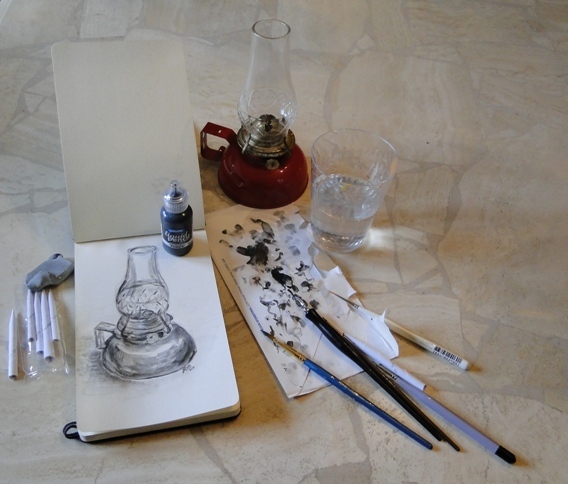 (One of my goals for this year is to do more of that – sketching.) AND, I decided to break open a fun new product I ordered in the fall – Pam Carriker’s “Liquid Pencil” Sketching Ink by Derivan. Step Two: Find a suitable subject. I started out with the tiny young Chihuahua we rescued over Thanksgiving. She was an eager subject but way too active. 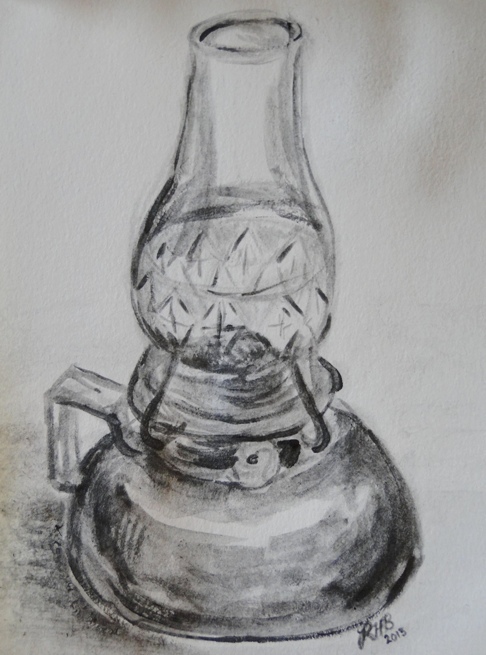 I then settled on a wonderful small red vintage oil lamp that I bought on Etsy a month or so ago. It has a lovely shape and a variety of textures with its metal base and glass globe. I was a little skeptical about this pencil-in-a-bottle – what’s wrong with drawing with an actual pencil? But I tried it on a brush and even a dip pen, and I must admit – it’s fun. You get that lovely graphite look and feel, but with loose strokes and washes, and concentrated darks for contrast. I simply used varied amounts of water here and there to thin the solution before dipping in. A tortillon worked great for blending, and I tried a kneaded eraser in a spot or two with good results as well. I give Liquid Pencil two smudged thumbs up! (And don’t let the small size of the bottle fool you… this is potent stuff, so a little goes a long way.) Be sure to check out the video with application examples at the link above. I just played before watching, but the video might give you even more ideas. 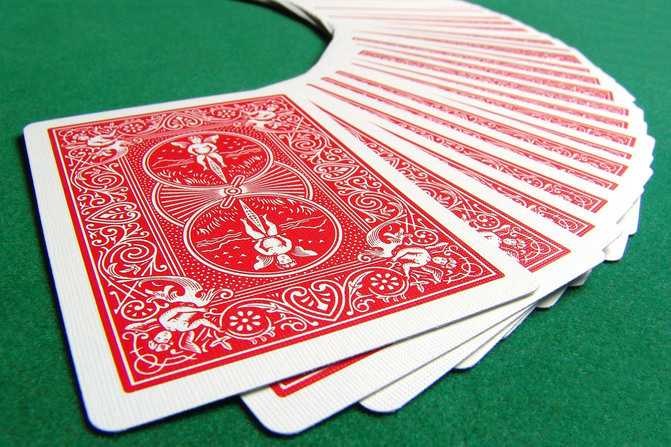 I look forward to experimenting and “playing” creatively throughout the New Year. How about you? Can you “begin where you are” and let loose your Muse? Thanks for visiting, and please share any thoughts about creativity below.